CYRUS KAVASMANECK, M.D. joined PBCC in 2009. 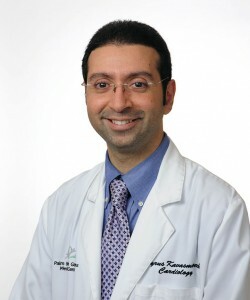 A graduate of Stanford University and the West Virginia University School of Medicine, Cyrus did his residency at the University of Florida Medical Center in Gainesville. He then trained in cardiology at the Cleveland Clinic – Florida Hospital and completed his intervention cardiology fellowship at Hahnemann University in Philadelphia. He is both a clinical and an invasive cardiologist. In 2015 he was selected as Director of Cardiac Rehabilitation at Jupiter Medical Center.